Consumer Financial Protection Bureau Deputy Director Leandra English is suing the Trump administration to block the appointment of Office of Management and Budget (OMB) Director Mick Mulvaney as interim director following Richard Cordray's resignation. English filed the suit in the U.S. District Court of DC on Sunday in order to block Mulvaney from taking over, an action directed by President Donald Trump, the Washington Post reports. English said Cordray had appointed her to be the interim head before he left. English worked for former President Barack Obama at OMB. "The President’s purported or intended appointment of defendant Mulvaney as Acting Director of the CFPB is unlawful," English's lawsuit said. English also released a statement regarding the lawsuit. "The talented and hard-working CFPB staff stand up for consumers every day. As Acting Director, I am filing this lawsuit to stand up for the CFPB," English's statement said. Despite her complaint, English is running into trouble already. The CFPB's own general counsel, Mary E. McLeod, stated Trump was the one with the authority to name an acting director. "I advise all Bureau personnel to act consistently with the understanding that Director Mulvaney is the Acting Director of the CFPB," McLeod wrote in a letter to CFPB senior leaders. The White House is using McLeod's letter as further proof of the president's authority to name the acting director. In Congress, Republicans appear to be backing Trump and Mulvaney while Democrats back English. 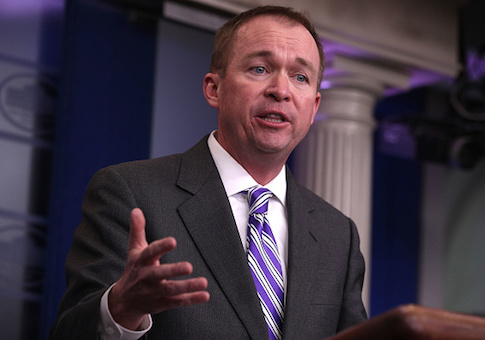 Mulvaney walked into CFPB headquarters with donuts on Monday, was welcomed by staff and shown to the director's office. NEW: Mulvaney was given access to the @CFPB director's office with "full cooperation" from staff, per a senior WH official… who also notes Mulvaney showed up with donuts. Mulvaney sent a memo to CFPB staff Monday morning where he directed staff to disregard English's claims. "Please disregard any instructions you receive from Ms. English in her presumed capacity as Acting Director," Mulvaney's memo said. "If you receive additional communications from her today … please inform the General Counsel." Also Monday morning, English sent an email to CFPB staff, signed "Leandra English, Acting Director." This entry was posted in Politics and tagged Consumer Financial Protection Bureau, Lawsuit, Mick Mulvaney, President Trump. Bookmark the permalink.